The idea of a band playing up to 8 hours a day in clubs seems unfathomable today, but that's what The Beatles did early in their career. And they did this for about 3 years in their home town of Liverpool and, later, in Hamburg, Germany. At first the band included drummer Pete Best and bass player Stu Sutcliffe (Paul was on rhythm guitar at the time). But by August of 1962 they had coalesced into the soon to be "Fab Four", with Paul moving to bass and Ringo Starr replacing Best on drums. And they were a finely tuned live music machine. 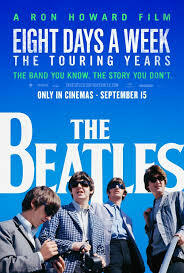 The new Ron Howard-directed documentary THE BEATLES: EIGHT DAYS A WEEK – THE TOURING YEARS blazes through this early part of the Beatles career, barely acknowledging Best or Sutcliffe, but still gives viewers just enough to understand the importance of this early foundation. Because once the band released their first recordings and became megastars, ushering in the era of "Beatlemania", it was their well-honed musical chops that insured the group could deliver the goods live, both on TV and in concert. And it was these concerts, filled with screaming, crying, and sometimes fainting young girls that took the Beatles to the next level and, ultimately, killed their love for playing live. But before things went completely sour, the band did have some good times amidst the whirlwind of their fame, and they left behind a fair amount of footage showing both their prowess as performers, and the absolute insanity occurring around them. Howard's film presents plenty of both, along with interview footage with the band, their associates, and some famous fans like Whoopi Goldberg and Elvis Costello. Aside from the live footage, which is arguably the main attraction, Howard also manages to show some of the more personal side of the Beatles. Notably, journalist Larry Kane talks about when he was sent to cover the group's 1964 tour (which he initially didn't want to do, not realizing the full cultural impact the Beatles would have). During his time with the band, Kane's mother passed away. Paul and John, who had both lost their mothers as well, showed an empathic side when they learned of the reporter's loss. They also showed their mischievous side, giving Kane considerable good natured ribbing during the tour. How interesting all this is will largely depend on whether you're a Beatles fan or not, or at least have some interest in the cultural impact they had. I'm more a Black Sabbath or Ramones guy, depending on my mood, but at least from a historical standpoint I found much of this documentary enthralling. You can hear about Beatlemania in an abstract way, but this film really shows just how insane it was, even beyond anything Elvis or Sinatra elicited from their fans. And it's also interesting to see how venues had to cope with providing security, sound systems, and all the trappings of a live performance for crowds of a size hitherto unfathomable. And yet, even the height of technology at the time wasn't enough to really let the music cut through the noise of the screaming fans. Along with the whole "can't go out in public without being mobbed" thing, that eventually led to the Beatles swearing off live shows and moving into the second phase of their career as a more experimental, studio-only band. As far as Howard's filmmaking goes, as with his scripted features there isn't much here that's flashy or innovative. Just your typical blend of archival footage, narration, and present day interviews edited together in an easily digestible fashion. Which is probably what you'd want for a movie like this, so no complaints. The version of EIGHT DAYS A WEEK showing at The Nightlight is accompanied by 30 minutes of bonus footage of the band playing at Shea stadium in 1965. The screener I watched did not include this (although some of the footage is in the documentary), but I imagine that will be as much a draw for Beatles fans as the documentary itself. 3 out of 4 stars.